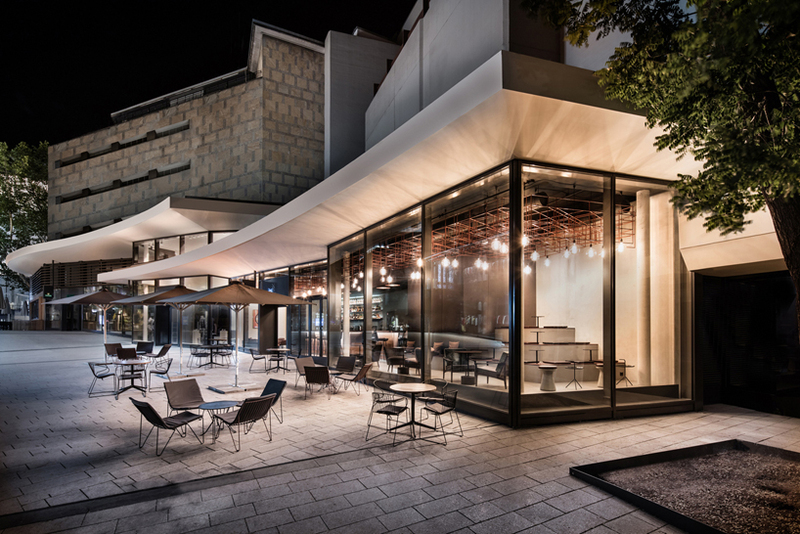 german architecture firm dittel architekten has developed the design concept for stuttgart‘s latest bar, eduard’s. 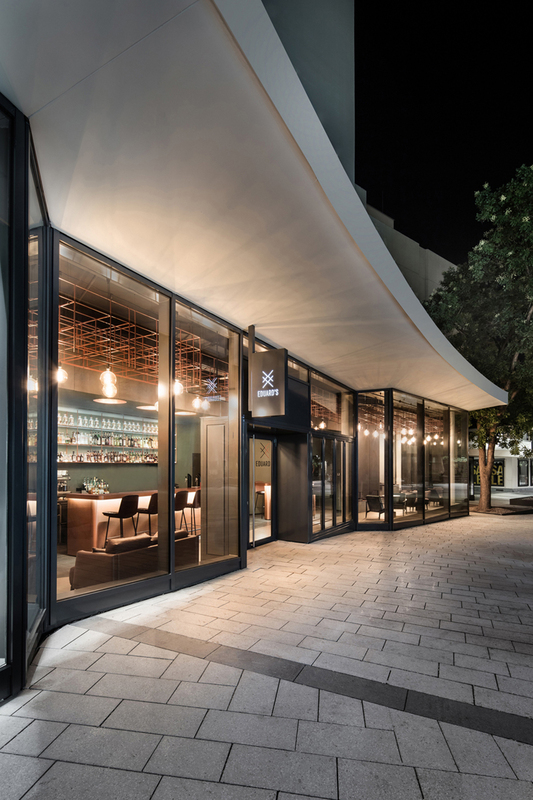 named after the founder of the breuninger department store, this new lifestyle bar is making a bold statement with its striking design. 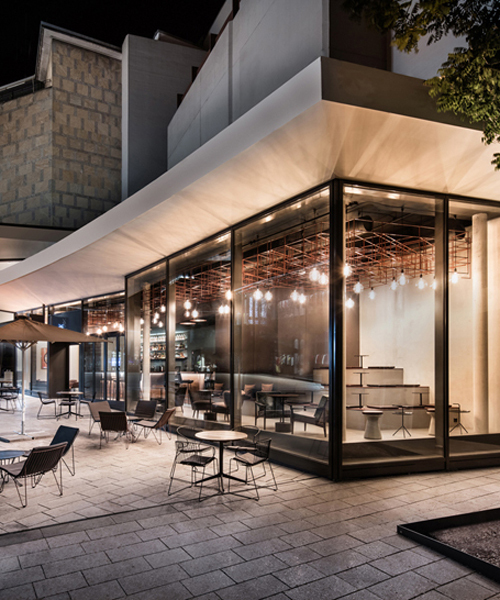 due to its subtle and elegant façade, the solid wooden bar remains unrecognizable to most. once inside, patrons immediately find themselves within the bartender’s field of vision with their first glass in hand. 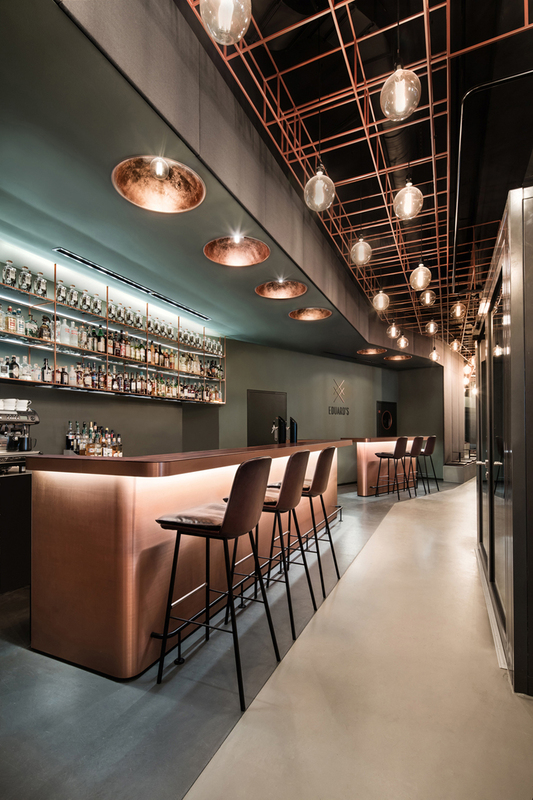 the narrow, five-meter high space is a defining feature at dittel architekten‘s eduard bar. 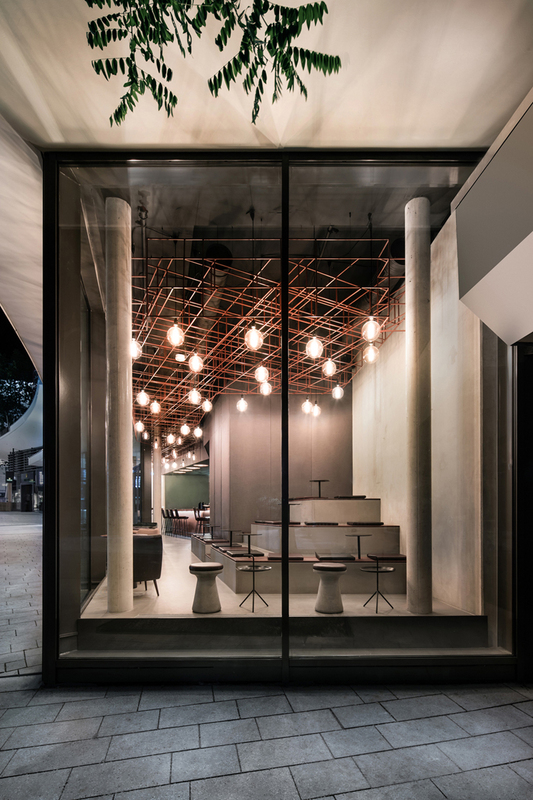 surrounded by opposing glass and brick façades, the bar is divided into a brighter area in the front and a darker area at the back, welcoming guest during the day and night. by day, spots along the glass façade are hugely popular as a result of the natural light. once it gets dark out, the bar becomes the focal point of the promenade. 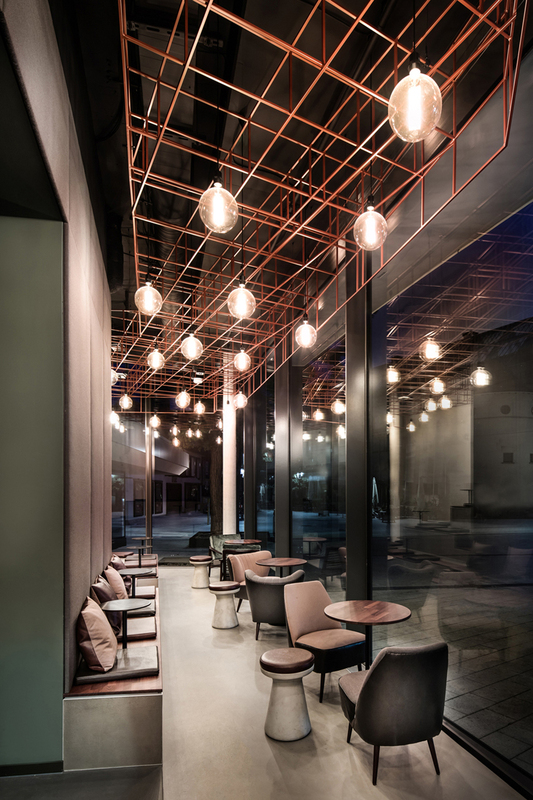 the defining copper tones highlighted by shades of patina and the reflection of lights create a one-of-kind ambience that glows invitingly when seen from the outside. 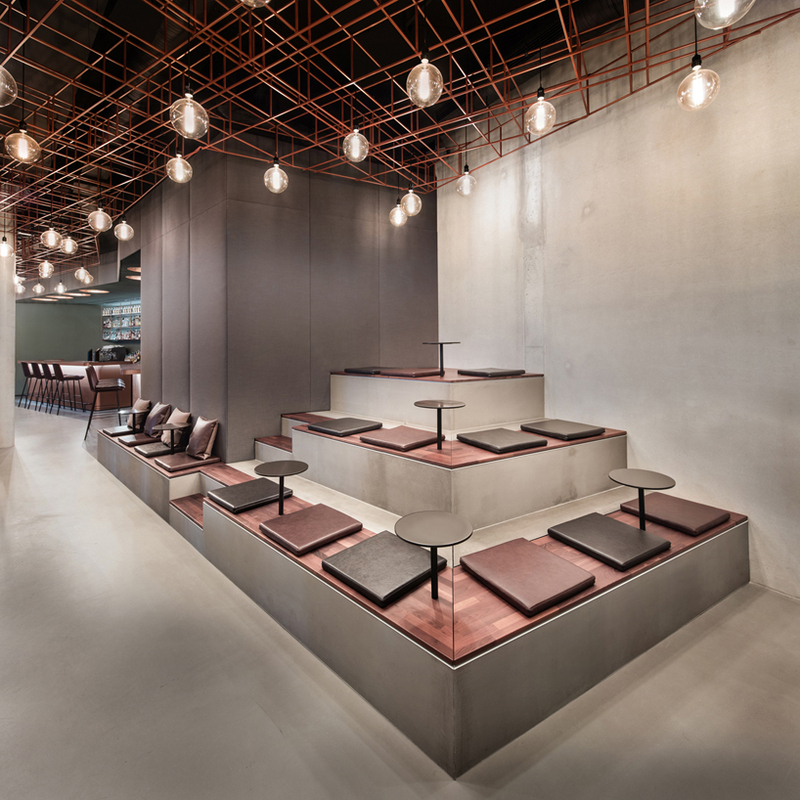 the rust-brown shelving accentuates the luminescent spirit bottles and the hand-crafted iron lamps in the suspended ceiling become stylish overhead lights. the striking ceiling installation, consisting of delicate, angular rods and eye-catching bulbs, completes the picture. 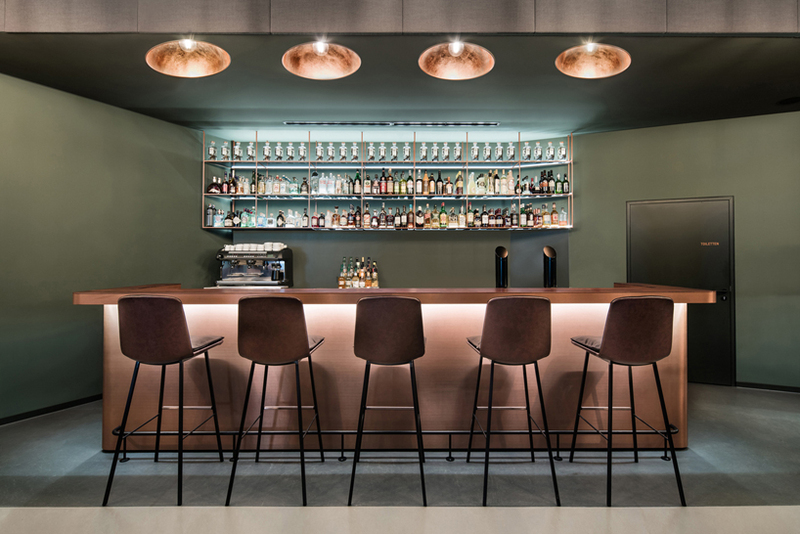 with a compact interior of 100 square metres and another outer 70 square metres, eduard’s offers seating arrangements to suit everyone’s needs: traditional raised stools at the bar or at the convivial side tables. those wishing to prolong conversations can either sit in the comfortable vintage armchairs or gather in groups on the sofas and seats, all of which look out onto the outdoor patio. the benches, conveniently surrounded by acoustic panels, become casual lounge areas that overlook the bar. 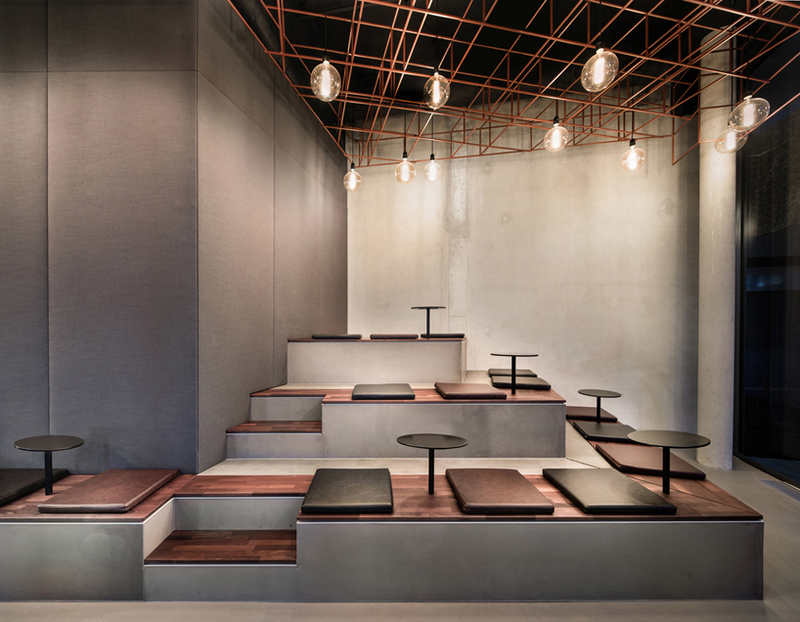 the elegant character of the metal serves as a contrast to the raw industrial floor and the exposed concrete walls. wall design elements and textiles in muted green tones, dark wood and rustic leather upholstery complement the colour and material concept.